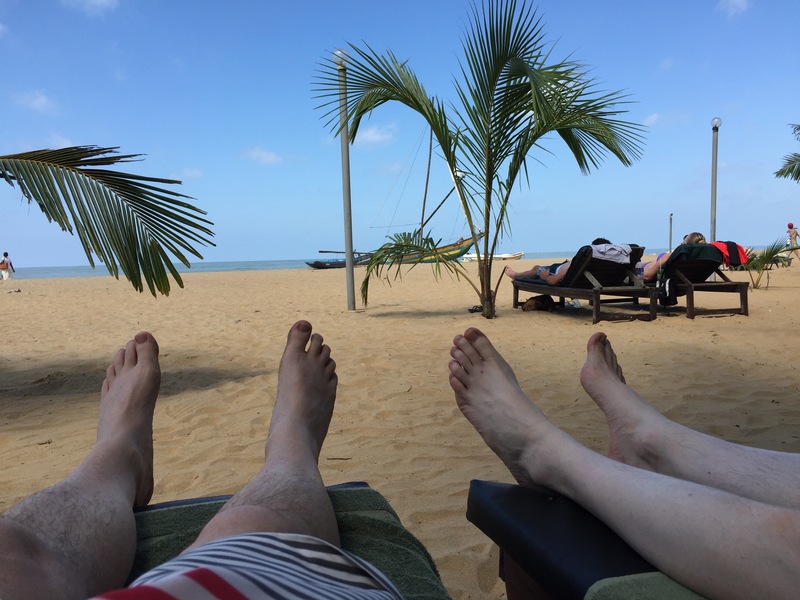 Well we have now been in Sri Lanka for 5 days and are enjoying the friendly people and relaxed lifestyle, although it is very hot and humid. We arrived very early Friday (2nd Jan) morning after spending 9 hours in Singapore. We managed to fill in time by catching the train between terminals and going on a free Singapore tour. Our transfer from Colombo to our hotel in Negombo was waiting for us although we did have difficulty finding the hotel as there were very little lights on in the streets at 2.30am. In the end Christopher had the phone number of the hotel so our driver rang it and got instructions. Awaking the next morning, Andrew realised that his phone was missing. We re-traced steps and realised we must have left it in the transfer car from the airport as it was nowhere to be found in the hotel. We made some initial phone calls to no avail and then at breakfast one of the Intrepid tour leaders approached us, thinking we were joining his tour that night. Our tour didn’t leave until Sunday but we asked him for help. He said, “leave it to me” and within an hour, the phone had been located and would be delivered to our hotel later that day. We then walked up the road to get some money from the ATM and start getting our bearings. 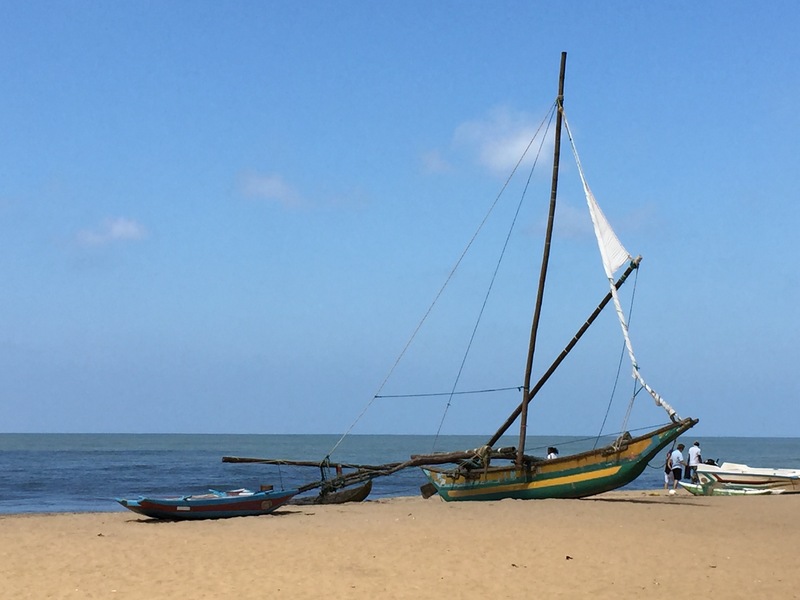 Negombo is located on the Indian Ocean and seafood is very popular. Tuk tuks are everywhere and the locals seem friendly and do not persist in selling you something if you say no. As our hotel had beach front access, we decided to take a swim in the luke warm water of the Indian Ocean. Then, as we were relaxing on the beach our driver from the previous night approached with the phone – talk about service! We gave him a tip and thanked him profusely. The travel angels are certainly looking after us. After lunch in a local restaurant we returned to the hotel for a nap. The rooms are air conditioned but the sheets are extremely thin and no blankets provided so sleeping usually consists of a few hours of air con on and waking up shivering followed by air con off and awaking dripping in sweat. That night, based on the recommendation of Lonely Planet, we ate at an Italian restaurant. I think the guide book needs to be updated as the pizza wasn’t that great. We have discovered Sri Lankan ice cream however and it is becoming a nightly ritual to have one from the nearby convenience store. At 40c each, the mango one is the best! The next day after a bargain breakfast for $5 each which included toast and jam, fruit juice, eggs any style and tea/coffee, we decided to explore more of Negombo. It is a seaside town and very Catholic with churches everywhere and statues of Mary and other saints in glass cabinets all over the streets. According to one local source, 95% of the population are Catholic. Perhaps it is this reason why Pope Francis will visit here later in the month. We walked towards the fish markets, visiting a couple of churches, including St Mary’s which is famous for its ceiling murals. It seemed that Saturday was wedding day and flowers abound – always white and the men dressed in dark suits with bright colours. Not overly practical considering the temperature!! The fish markets were smelly but very busy. As we looked at all the fish drying, a local approached us and became our guide as he explained the various fish. He said he appeared on both Peter Kuruvita’s and Rick Stein’s programmes on Sri Lanka. We shall be checking when we get home but are not expecting to see him. We had a quick break in the Ice Bear Cafe before organising a three wheeler (tuk-tuk) to take us to a Buddhist temple and then back to our hotel. We are working on an approximate exchange rate of $1=100 Rupees so 600 Rupees seemed like a good deal. The temple was interesting with a 6m reclining Buddha and our speedy driver delivered us back to our hotel in one piece. We joined our tour group the evening after spending a relaxing day by the hotel pool and wandering around town. Our group of 12 consists of 1 Dutch man, 2 New Zealanders, 1 English woman and 8 Australians. We are all getting along well so far and we have a vast amount of travel experience between us so it is great to share stories. Our tour guide, Rohan is a quite chap who is an Aurveydic doctor but now works as a tour guide. In the group we have teachers, an electrician, a vet, a surveyor amongst others so we should be able to overcome most situations. Following our briefing we went to dinner where we all tried the national dish – curry and rice. I had pork curry and Christopher had beef – both were a little tough although tasty. The next day we travelled 170 kms to Anuradhapura via private mini-bus. It took us nearly 5 hours and the roads are very busy. Overtaking is done at any time so two lanes of traffic is usually three and the horn is used to encourage other vehicles to move over to let us pass. 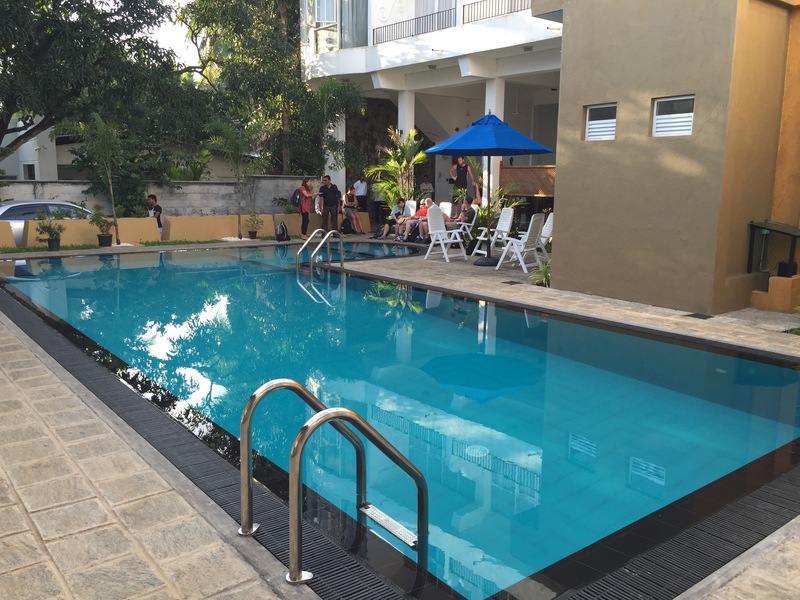 Our hotel, Ceylan Lodge is very comfortable and has a very inviting pool. In the afternoon we visited the ancient Buddhist site of Mihintale which is considered the birthplace of Buddhism in Sri Lanka. It involved climbing many steps on a humid afternoon but the views were spectacular and well worth it. Dinner tonight was buffet style and we got to try hoppers (little bowls made of rice flour with optional egg) and kottu. Kottu is a dish of vegetables, egg, spices and chopped up roti. It is mixed up using two metal blades which are banged on the hot metal plate and the sound is deafening. The taste is delicious! We also tried buffalo curd drizzled with honey . Andrew won’t be trying that again but Christopher quite liked it. We also had a dessert which was quite tasty and similar to our puddings. An early morning start this morning as we left the hotel on pushbikes to explore the ancient city of Anuradhapura. Our guide and helpers ensured we didn’t get run over by trucks or three wheelers and at one stage stopped traffic in a roundabout to ensure we all got across safely. 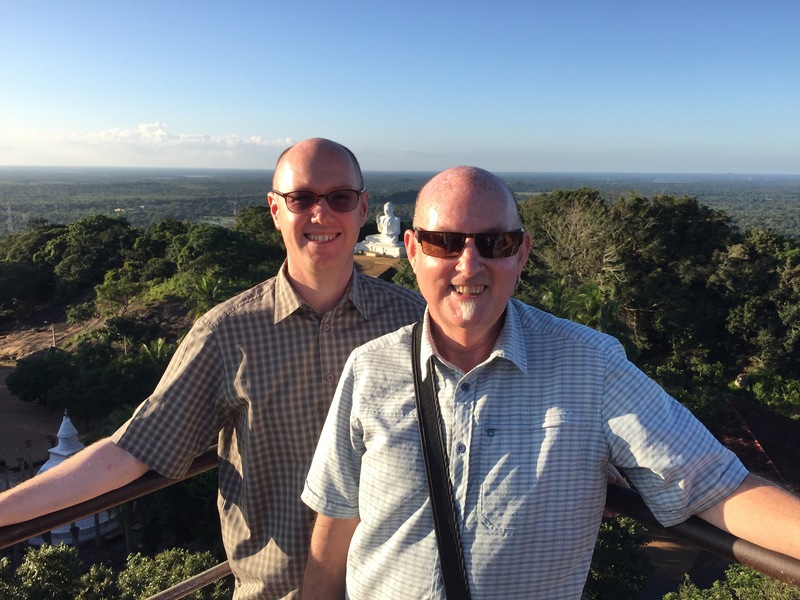 We visited many stupas, including the third largest monument in the world (after the two pyramids in Egypt). The whole city was very tranquil and green and you could easily imagine the thousands of monks living in these surrounds. Lunch was a picnic provided by our guides which was set up beside the largest water pond in the park. Pineapple for dessert was very sweet and tasty as it always seems to be whenever we try it. The bananas are smaller than ours but much tastier. Sounds like you are having a great trip so far! I hope you continue to eat well and not have any issues with dodgy food. 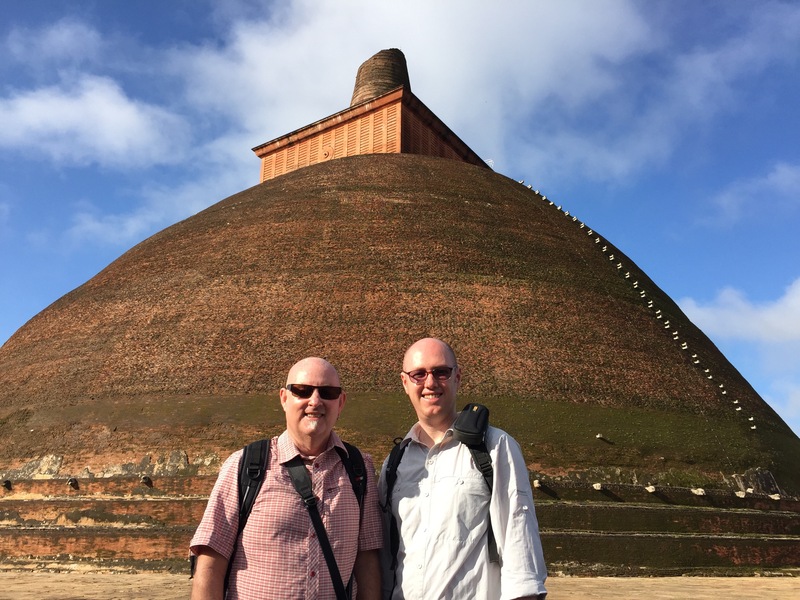 Loved the photo on Facebook of you both at Anuradhapura! Stay safe and enjoy! Jealousy rears its ugly head again as we watch you enjoy the trip we wish we were on with you. Hopefully next year. Already i am imagining finishing off the parts of your meals which for you seem a little too much. Mango ice cream is one of my favourites and at 40 cents a pop I can think of no better way to spend $4. You are both looking great and nice to know that you have kept up your bicycle skills. Thanks for the great post and keep living the dream. Looking forward to the rest of your adventure. Glad the trip is going well, the food sounds good & love the clear swimming water. Everyone here fine Will back from Paddy,s River & Chris from Mookrewar Ben in Brisbane for cricket last week-end & Cate settling Joe in Melbourne. Has been hot but have had 2 good falls of rain, think Sydney has had a few storms. Everything starting up after Christmas Dad on Westhaven bus this week Rotary BBQ at Kevin Mason,s last Sunday very enjoyable. Take care have fun.